This vegetable-inspired version of traditional stuffed shells freeze well either as a casserole or individually for a quick microwave lunch. Cook pasta according to package directions. Rinse, drain, and let cool. In a large saucepan, heat broth to boiling. Stir in carrots, potatoes and onions and cook for 3 to 4 minutes or until vegetables are tender. Drain vegetables well. Combine with ricotta, mozzarella, egg, and 1/2 cup Parmesan cheese in a large bowl. Stir in Italian seasoning. Fill each cooked and cooled shell with this cheese mixture. If freezing individual stuffed shells, see "Alternate Preparation" below. Pour 1/2 cup of the spaghetti sauce in the bottom of a 9x13" baking pan. 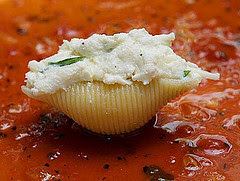 Arrange stuffed shells in a single layer on the sauce. Pour remaining sauce over top. Sprinkle with 1/4 cup Parmesan cheese. Top with shredded mozerella cheese. To freeze, refrigerate at this point until cold. Then wrap, label, and freeze up to 3 months. To bake immediately, cover with foil and bake at 350 degrees for 20 minutes. Uncover and bake for an additional 15 to 20 minutes or until hot and bubbly. Remove casserole from the freezer and thaw overnight in refrigerator. Bake as directed above, adding 15-20 minutes to baking time. To freeze individual shells before adding sauce, simply put 1 to 2 shells in individual ziploc bags. Refrigerate until cold and then freeze for up to 3 months. To thaw and reheat individual shells, remove from ziploc bag and place on microwave-safe plate or bowl. Top with marinara sauce and parmesan cheese. Microwave on 40% power for 2 to 4 minutes until thawed. Top with some shredded mozzerella cheese. Then microwave on 60% power for 1-3 minutes until hot and bubbly.